Queen Victoria’s diamond jubilee produced two imposing new buildings, the Legislative buildings and the new post office. This site was the home to the new post office, opened on July 1, 1898 after three years of construction. Designed by Department of Public Works architect, Thomas Fuller, it was an imposing site appropriate for Her Majesty’s government. By 1907 when the streetcar travelled by the building housed the Post Office with Noah Shakespeare as postmaster, the Public Works Department with William Henderson as architect, the Inland Revenue Office with William Gill as district inspector, the Post Office Inspector’s Office and Dead Letter Office with Evarard Hyde Fletcher as inspector, the Weights and Measures Office with Hugh Findlay as inspector, the Meteorological Office with Reid E Baynes as superintendent, the Government Telegraph Service with Dee William in charge, and the Dominion Customs House with William Marchant as inspector. In 1952, postal services moved up Government Street to the 1200 block and this building was converted in 1956 for Customs and Immigration use. A series of alterations produced a building that was devoid of ornamentation and unsympathetic to the original building, of which a section was retained to the rear. In the 1980s, a group of local merchants petitioned the federal government to rework the design to more accurately reflect its origins. 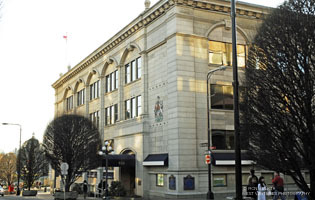 In an editorial dated April 30, 1988, the Times Colonist noted: “It is time to make amends for the heritage violation wreaked by Ottawa decades ago to provide once again a grand, stately entrance from the waterfront to Victoria’s charming Old Town. ” The resulting alterations to the facade of building is an improvement and does contain Edwardian elements.